Bon Chef Stainless Steel Swirl Full Size Tile, 12 3/4 x 20 13/16 inch -- 1 each. The same dimensions of a standard hotel food pan. -- Fit standard well openings and standard food pans, no measuring. Spacer bars are available in S/S and Sandstone standard colors. -- Available in Sandstone (cold application only), S/S, Bonstone, Skin Insert Tiles, New Swirl S/S and Rectangle S/S Tiles. 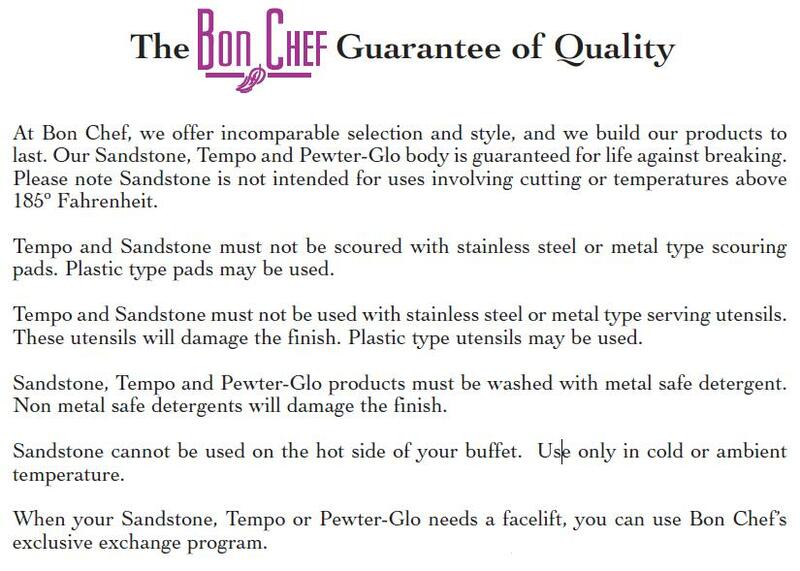 -- Fit standard and NSF 7 wells and Bon Chef rectangle chafing dishes. -- Simple to order, just order them to fit a standard well by how many food pans fit the well opening. -- Available in 1/2 size, full size and double size. They correspond to 1/2 and full size food pans. Double equals two food pans. -- Can be custom cut to receive our standard Bon Chef inserts Also available in many precut styles.